PWTech Submerged Aerated Filter: Submerged fixed-film biological reactor for proven treatment of domestic and industrial wastes. This high-performance submerged aerated biological filter provides proven treatment of domestic and industrial wastes in hundreds of installations worldwide, the Submerged Aerated Filter (SAF) has few moving parts, requires very little maintenance and is easy to operate. The SAF could be described as a box of media. It utilizes a rigid, corrugated, structured polypropylene media to give a high surface area for biomass attachment (200 ft² per ft³). The media is arranged into cells-in-series where effluent is contacted with the fully submerged media in the presence of co-current aeration. Use of high-quality components means that a SAF will give many years of service. Please download our product flyer for more details. The external walls of the SAF are manufactured of ¼" steel or ⅛" 304 Stainless Steel, with pressed ribs for stiffening. The surface is coated and may also be insulated for extreme environments. All plumbing is polished stainless steel and ABS or PVC plastic as standard. Air is supplied by two low-maintenance regenerative blowers (Duty-Standby). These are housed in a fiberglass kiosk along with the controls. 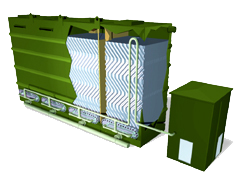 A secondary clarifier tank follows the SAF for removal of any biomass that sloughs off the media during operation.